On a daily basis, we help thousands of professionals and agencies to accurately track and monitor their SEO rankings in order to report and get notified when Google SERPs change. One of the main factors of your website's performance is the ability to accurately track its keyword rankings. The SERP Checker Tool provides one of the most in-depth keyword analysis. Tracking your SEO campaign daily at a universal, local and mobile level, our keyword ranking tool gives you a complete view of your keyword performance and the search volume data. This helps you to make the correct strategic decisions. 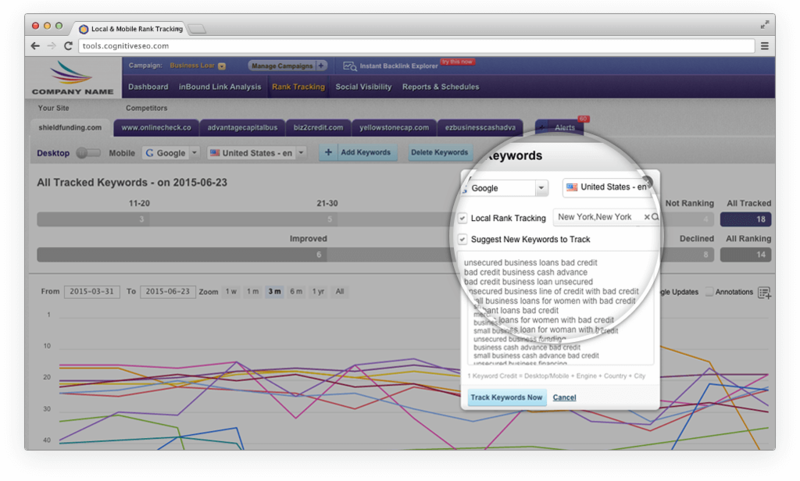 The tool offers accurate country, language and city precision for all your tracked keywords. Understanding the power of contextualized search engines rankings, our Google ranking checker integrates mobile tracking and mobile keyword research, giving you a detailed perspective of your ranking data and keyword position (for universal and local tracking, weekly or daily ranks). Get accurate results through our local and universal SEO rank tracker. Because the same tracked keyword can have different SERP positions on local rank tracking, on mobile rank tracking and on universal search results, our rank tracking toolset helps you always be in touch with your real Geo-specific keyword rankings for any location. Our Keyword Tool and Content Assistant is a tool that is perfectly adapted to the digital marketing realities and designed to help you to improve what matters most: search engine rankings. At the moment is the fastest way to boost your Google rankings and to visualize ranking reports. Our content optimization tool is a must for all SEO professionals as it delivers higher SEO rankings & increased organic traffic in a matter of hours. No backlinks required, no other extra work. Just a good, relevant, optimized content with our keyword tool and you'll get in top Google ranking results. 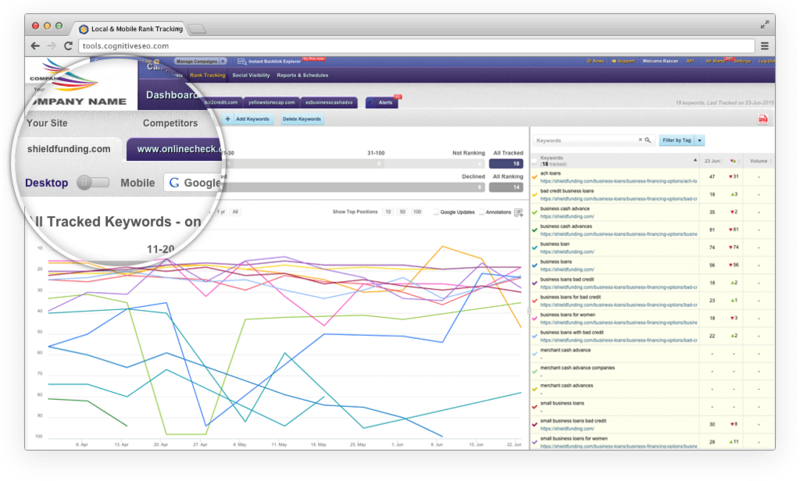 Having the capacity to track the position of tens of millions of keywords, the cognitiveSEO toolset provides unparalleled ranking performance data for any website. 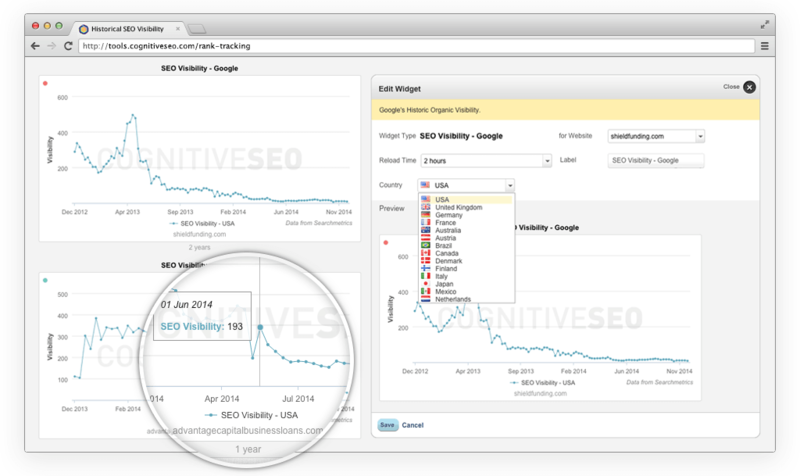 The Google Visibility monitors the search performance of a website. It presents the historical development of a domain’s visibility in Google search. It has two components: search volume and the Google position of the ranking keywords, reflecting how often a website shows up in the search results. The SEO Visibility grants you with great insight of the organic search market's volatile environment and also helps you easily identify trends, do competitor analysis, improve your SEO campaigns but also track keyword rankings of your competitors and get specific keyword ideas. Use our Keyword Explorer to reveal thousands of topics & keywords opportunities in just a few seconds. You can now identify not only new topic ideas but also the keywords it is worth investing in on a local and global market. You will find out the most relevant keywords for you, along with their monthly volume, cost per click and other related data so you can better craft your SEO strategy and improve your rank positions. Our advanced keyword research tool takes data from huge proprietary databases, constantly updated, search engines suggestions, autocompletes from multiple search engines and many other relevant sources. No need to combine data from Google Analytics, Search Console and many other apps as you have all the keyword data you need in just one SEO rank tracker toolset. 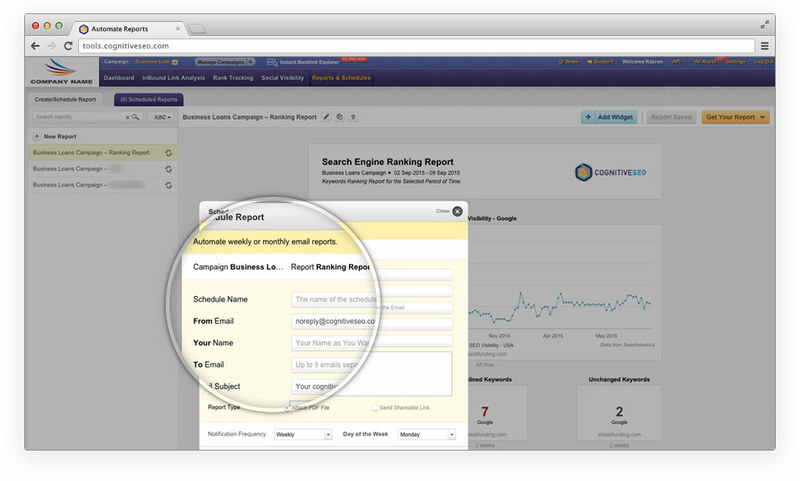 Our SEO Toolset's alerts system automatically sends notifications for any sudden local, and global change of your daily or weekly tracked keywords to you, your team or your client. This way, you can react on the spot to fix any possible issues, to improve you SERPs or SEO strategy, or to take advantage of great opportunities on the right amplitude. We know how important it is to regularly do rank checks on Google, Bing and Yahoo. But we also know that in order to accurately track changes of your websites rankings and do precise SEO audits, you need to segment your data so you can have a clear image of your digital marketing strategy. 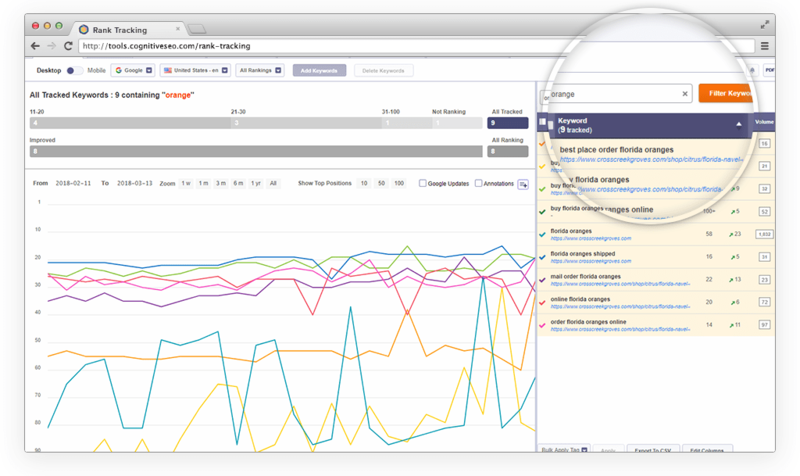 Our rank tracking tool has advanced filtering capabilities, so you can see how your local SEO strategy performed or how your mobile ranks are evolving comparing to the desktop ones. Our SERP ranking tool allows you to track not only your site's rankings and keywords but also your competitors' ranking reports. 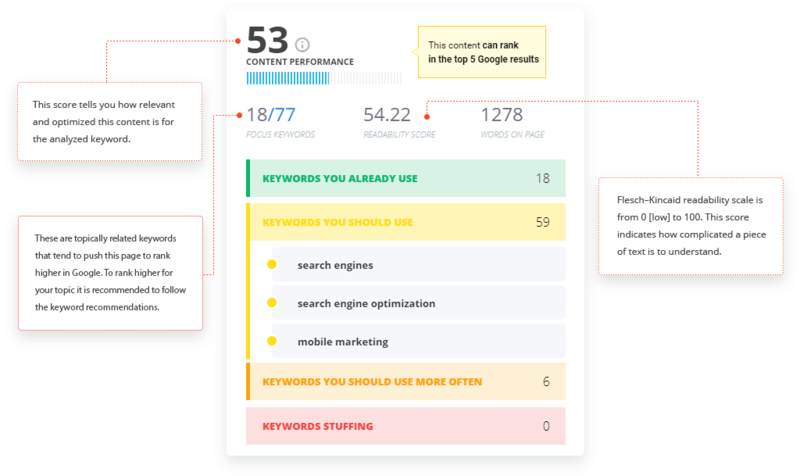 cognitiveSEO's keyword position checker tool gives you a clear image of how your competition is performing, uncovering their keyword ranking strategies &rank positions, unveiling keyword opportunities and helping you outrank them easier. 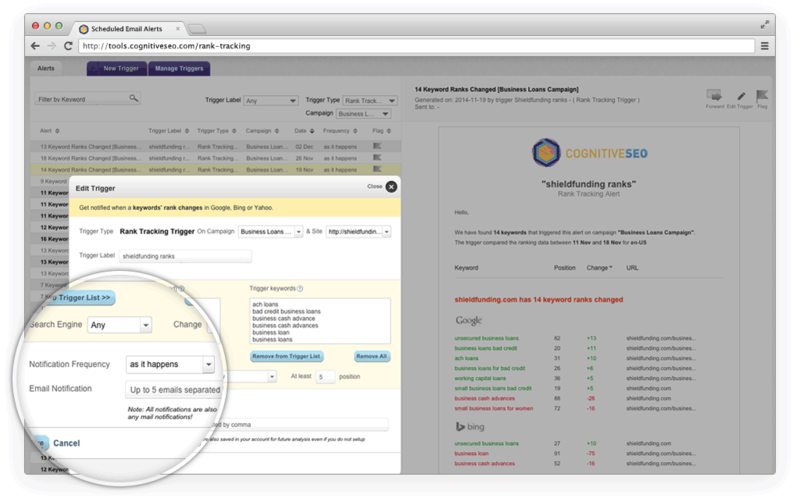 The cognitiveSEO toolset allows you to white label and customize the look and feel of the tool to your own company's identity. White label reporting is highly important as your digital marketing data along with your ranking results should have your mark.You can make your Rank Tracking Reports stand out by having the possibility to fully personalize and schedule them so you can automatically send your ranking performance to your clients. Creating white label SEO reports, combined with the advanced reporting capabilities of our rank tracker tool will definitely offer you a competitive research advantage an ever-evolving market.